Is anybody using on their C5 and if you are where can I get the complete for it? The product that seems to get the most positive comments is from forum supporting vendor CARTEK. From past posts, it comes complete with pre-bent lines and everything you'll need. You can find their ad on the main menu page, in the column to the left. Some other members have used HURST or other after market brands with success, the primary negative complaint being having to bend the lines. Do a search in C5 Tech using keywords "line lock" or similar and you should find some past discussions with images of installations. Cartek line lock here. Good kit. Easy to make your own and if you use the Hurst solenoid and get your own fittings/bend your own lines, you'll be in it for under half of what the Cartek kit costs. I'm new this so I will probably buy the kit. where do you get the fittings and lines at? I got the adapters for the solenoid (7/16x24 to 1/8 NPT) from Napa, and the M12x1.5 and 7/16x24 1/4" line fittings from a place called Fed Hill (google it). Needed two of everything, plus 1/4" brake line. Yes, these are all the adapters needed, and there's no stacking or adapters save for on the solenoid itself due to there being no 1/8 NPT adapter for a 1/4" brake line. If you go to your local parts store and get a straight piece of 1/4" line that's about 60" long for about $8-10, you'll get two of the fittings needed (the 7/16x24 fittings) and all the line you'll need. I'll be posting a complete write-up with pics and part numbers and pricing for what I did within the next couple of days now that I have my car buttoned back up. SUMMIT RACING sells the HURST line lock product, but it doesn't come with fittings/brake lines. They made it easy with offering those separately...then you'll need patience and a quality tubing bender. 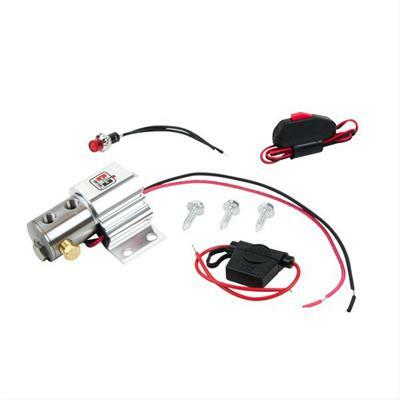 Go to the SUMMIT RACING website and use keywords "HURST line lock" and you'll find the solenoid, lines, fittings/adapters. Last edited by hotwheels57; 10-17-2007 at 03:41 PM. Our Cartek line lock is a prebent kit that bolts right in. If your interested just shoot me a pm or call.